You will be welcomed with a glass of Prosecco, a three course meal with a half bottle red/white wine per person, tea or coffee, and three games of bingo with the chance to win fabulous prizes (house prize is often valued at over £100). Lots fun and laughter and hosted by our Patrons Grant Stott and Tonya Macari. You can be sure that our organising team have worked hard to bring you as good an event as we can at a great price and of course, as it is a fundraiser to help children and teens with cancer, we aim to raise a reasonable amount at the event! So we have added in a spectacular auction as well! 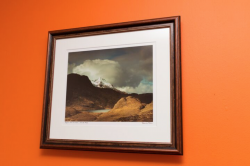 - Provision of wall art in the new oncology ward at the new Royal Hospital for Sick Children in Edinburgh and the upgrading of chairs for parents - we will be providing 100 'as comfy as we can get in the NHS' chairs for parents to sit on while they are with their children in hospital whether on the ward or at clinic. Make sure you keep updated on facebook with It's Good 2 Give . Auction items on this page will be open for bidding online until 12 noon on 9th May 2018. Bidding will then re-open to the guests at the Ball on Thursday 10th. If you cannot attend the Ball, to give yourself the best chance of winning a lot, please place a proxy (maximum) bid on this page before the 11 May deadline. The leading online bid and proxy bid on each auction lot will then be carried over to the auction at the Dinner, where bidding will continue on your behalf to your maximum. 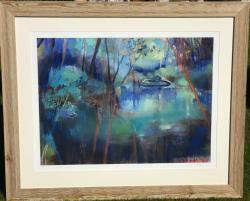 If you are still the winning bidder at the end of the evening, we will contact you afterwards to let you know. Dig deep, have fun and enjoy a fantastic fundraising evening! 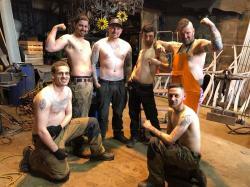 Escape the city and the corporate world, to spend a day to remember, in the strong and skillful hands of Kev Paxton, Artist Blacksmith and television personality. At the end of your day, leave with a sculpture forged with your own fair hands. Date will need to be agreed between winning bidder and ArtFe. 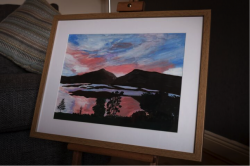 Lovely original painting of Loch Venachar by friend of It's Good 2 Give, Serena Hale. Another lovely donation from a great It's Good 2 Give supporter. 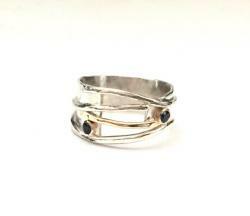 Jewellery designer Susanna Hanl has used Strands of silver and gold to create a unique ring and adorned with sapphires. If you would like to try the ring on for size please speak to a member of the IG2G team. 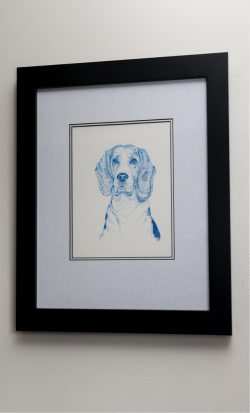 Artist Ingrid Nilsson is a great supporter of the charity and has specially painted this Beagle for us. "Keeper for a day" is Blair Drummond's wildest experience. Keeper for a Day runs from 9am to 3.30pm; lunch and refreshments are included. 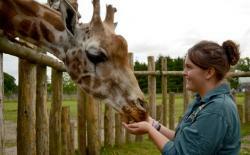 As part of a group of up to three people you will be assigned to one of our experienced keepers. So look out your wellies, roll up your sleeves and enjoy your day! You will be preparing food, mucking out, helping with enrichment for many of our animals including, elephants, giraffe, meerkats, lions and lemurs. Vouchers are valid for 12 months from the purchase date.All animal experiences are entered into at your own risk. You will not be able to book the experience during close season, Easter weekend, the May Bank Holiday, Christmas or New Year holidays. Pregnant women and women who have given birth within the previous 6 months will NOT be able to participate in the experience. 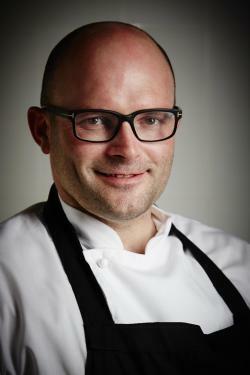 Ally McGrath from the Osso Restaurant and BBC 2's The Great British Menu will cook in your home for up to six people. His Peeblesshire eatery is the only Borders restaurant to hold a coveted Bib Gourmand Award in the 2018 Michelin Guide, a place which has been held eight years in a row. Please note the location should be within the Borders & Lothians. Date to be agreed with Ally McGrath who, as you can imagine, is a very busy chef! Please understand that the date chosen may not be soon. The food is included in the prize but you supply the alcohol! 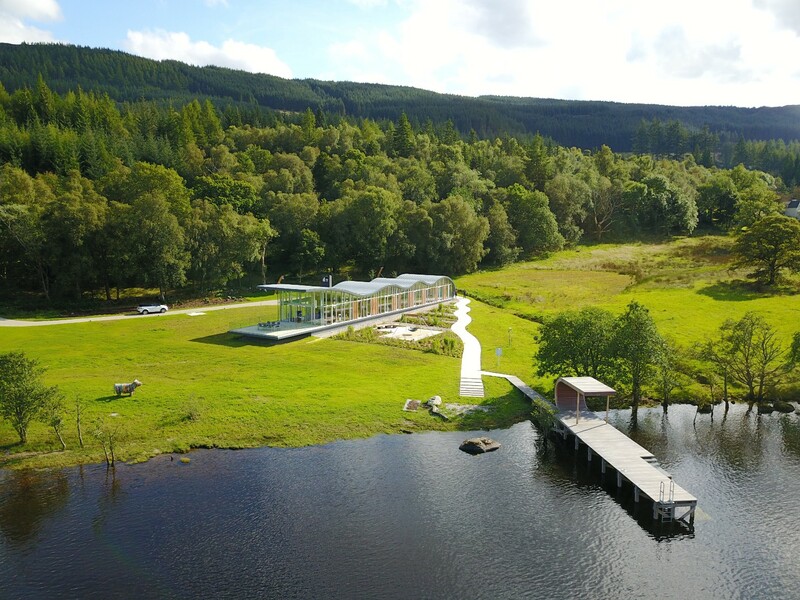 This is a superb location for a family holiday, hidden away in Invertrossachs in Loch Lomond and the Trossachs National Park. Your journey to the cottages takes you through some of the most spectacular scenery along the side of Loch Venachar. Originally built at the beginning of the 1900s. 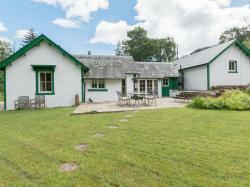 Exceptionally well furnished for a relaxing holiday in a picturesque location with footpaths from the doorstep. Sleeps 8 people in 4 bedrooms with 4 bathrooms. 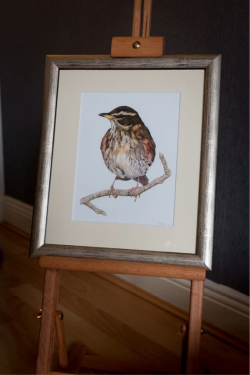 We have been donated this lovely picture of a Thrush. Not sure if it is an original but it sure is pretty! 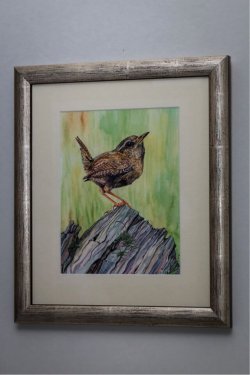 A lovely picture of a wee Wren. 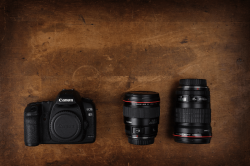 Gift voucher for a family photoshoot with Blue Sky Photography, 90 Morningside Road. 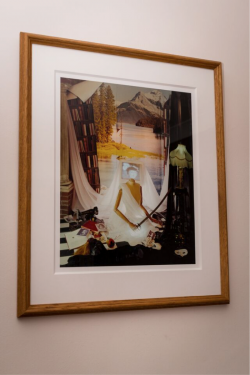 Package includes a one hour studio session, an exclusive viewing and design consultation after the shoot and the package also includes two framed photos (one medium and one small). 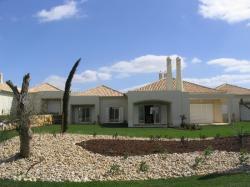 Spend seven nights in a beautiful villa, located near Carvoeira and just minutes from Canerios beach. Vale D’Oliveiras Quinta Resort and Spa is an elegant resort in The Algarve with panoramic views over the Monchique Mountains and surrounding golf courses. The Resort offers all facilities one would expect in a 5 star environment. It’s designed to provide a self contained and tranquil environment for the enjoyment of family, golf holidays, and short breaks throughout the year. •	Perfectly located for golfers, lots of courses close by. 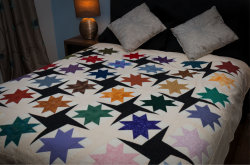 This is a stunning hand made quilt with stars. Made just for us by one of our volunteers' mums. Fletcher's Cottage Spa is one of a kind in Scotland… a haven of rustic luxury where you can deeply unwind and relax. Every detail exudes quality at Fletcher’s Cottage. You will be bidding for 4 "Fletchers Spa Day" vouchers. The luxurious spa day package at Fletcher's Cottage Spa includes full use of spa facilities including Marine Steam Room, Herb Aroma Sauna and Relax along with a cleansing Mud Cure Rasul experience using invigorating Spiezia lemongrass scrub and moisturising Spiezia body oil. To complete the experience enjoy a decadent afternoon tea. Above details are of a typical spa day, these might change slightly when you attend. 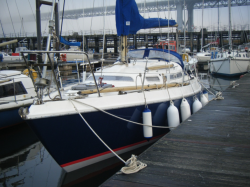 A 2 hour trip on ‘Sapphire Spirit’, for up to 3 people on the Firth of Forth, sailing under the Three Bridges. Sapphire Sprit is a 30 foot yacht berthed at Port Edgar, South Queensferry. The two hour trip can be arranged to suit the winner. There will be a crew of 2 to take up to 4 others out on the Forth and sail under the 3 Bridges. All safety equipment will be provided (life jackets). The winner can participate in the sail and learn about sailing or just sit back and relax and let the crew do all the work. The sail will be weather dependent and the winner and friends should ensure that they have warm clothing, a waterproof jacket and flat shoes (trainers are ideal). Dust down your diamond & gemstone expertise with this magical experience, offering a rare insight into the world of gemstones, from the beginning of gemstone mining to how we examine gemstones in the trade today. 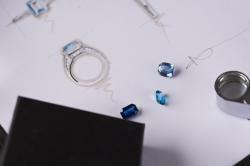 Bring along 5 friends for a fascinating Gemstone Experience, with Moira Patience from Moira Patience Fine Jewellery. Award-winning jewellery designer Moira honed her skills in various roles for industry leaders such as Stephen Webster and Hamilton & Inches, and has vast experience of the luxury jewellery industry. Enjoy champagne and canapés, and marvel at a selection of rare and precious stones from around the world, and an array of diamonds to dazzle. You’ll never have seen such an array of colour and sparkle in one room! The lucky winner of this prize will also receive a £250.00 voucher towards a piece of Moira's existing jewellery collections, or indeed the voucher can be used to create your own fabulous piece of bespoke jewellery! A round of golf for 3 people with a member of the club (Stephen Inglis). Breakfast before play and lunch after. This is a rare opportunity to play this course and if you are a golfer (or have a golfer partner) it's a great one to bid on! Gift voucher for 6 people for Escape Edinburgh, Scotland’s top escape rooms, 1 St Colme Street. Locked in a mysterious room with 60 minutes to get out. 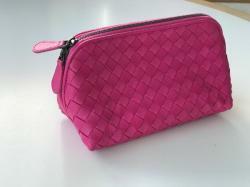 Faithfully crafted in Intrecciato, this beauty case is a refined travel accessory. The double zipper provides easy access to the cotton-lined interior, which has been finished with an embossed leather logo tag. A large ground floor flat that sleeps 8, with 4 bedrooms (1 king, 1 double, 1 twin, 1 bunk beds), 2 public & 3 bath / showerrooms, utility room & boot room. It has its own front garden with off street parking for up to 4 cars & an enclosed south facing back garden. 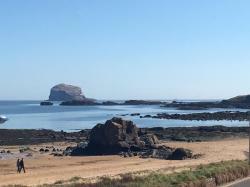 It is situated on Marine Parade in North Berwick which is a few steps from the beach at East Bay with stunning panoramic views of the East Bay & the Bass Rock. Perfect place to enjoy all that North Berwick has to offer for families, a group of friends, golfers, walkers or bird watchers. This townhouse sleeps 4 in 2 bedrooms and 1 bathroom. It is located in the town of San Pedro del Pinetar on the Costa Calida. 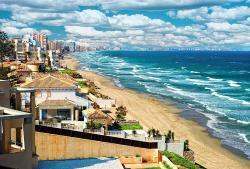 The nearest airports are Murcia approx 15 mins drive and Alicante approx 50 mins drive. The house is an 8 mins walk to the town square with plenty restaurants and bars. You can walk or cycle (3 bikes available) to the Mediterranean beach or the Mar Menor which is a lagoon with a beautiful promenade. There are shops and supermarkets all within walking distance, with a small general store opposite the house. There is a fully equipped kitchen, lounge / dining room, cloakroom, back terrace, twin bedroom with upper balcony, double bedroom, bathroom and sun terrace on the roof. Towels and bedding provided. Image not representative of accommodation or view! Please ask one of the team if you would like to see the brochure. John at Bloemen Ecke has been a friend of It's Good 2 Give for over ten years. Once again, he has provided the table flowers this year. (you can buy them at the end of the evening for a bargain £30 by the way). 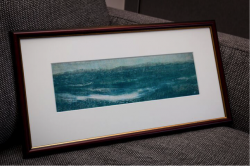 He has also very kindly donated this prize. 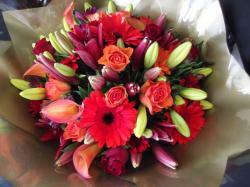 A bouquet of flowers delivered to an Edinburgh address once a month for a year. How fabulous would that be? 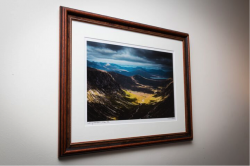 John's shop is now located on Comiston Road, Edinburgh. 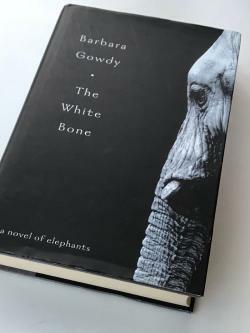 Our thanks to author Barbara Gowdy for donating this signed book. Elizabethean England. It is a Golden Age of trade and art; merchants and poets from across the world pack London s streets. There s a new commodity people need-oil. And young Nat Bramble knows just where to get it... Nat and Darius Nouredini, a poet in a wrestler s body, set off in search of the secret oil well under the abandoned Temple of Mithras in Persia. But their venture lights a trail of fire which ill follow Nat all the way back to England, where he becomes caught in the crossfire of a war between the crown and the first corporations of London. 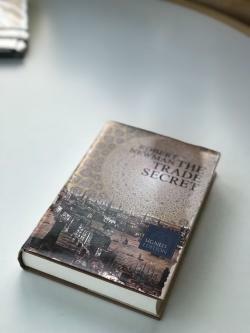 A swashbuckling, rolicking tale of espionage, intrigue and adventure, this beautifully written and researched novel will dazzle and delight readers as we follow Nat Bramble to the ends of the Earth and back again. The Ripple Retreat inspired these gorgeous coloured bracelets with a ripple texture. 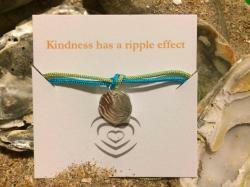 30% from the sale of these bracelets will be donated to It's Good 2 Give - The Ripple Retreat and the amazing work they do. Item might need to be ordered if not enough stock. Delivery time will be advised. The bracelets are available in the following colour combinations: green and turquoise, navy blue and light blue, coral and green, light blue and turquoise, coral and light blue, green and light blue, green and grey. Please see a member of the team to choose your colour combination. scroll through the photos and you can see some of the choices. 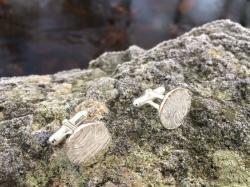 The Ripple Retreat inspired these smart cufflinks with a ripple texture. 20% from the sale of these cufflinks will be donated to It's Good 2 Give - The Ripple Retreat and the amazing work they do. 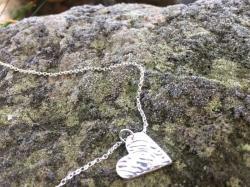 The Ripple Retreat inspired this beautiful heart pendant with a ripple texture. 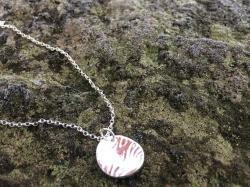 33% from the sale of this necklace will be donated to It's Good 2 Give - The Ripple Retreat and the amazing work they do. 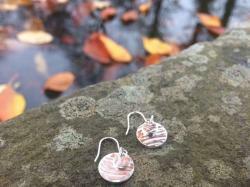 The Ripple Retreat inspired these beautiful earrings with a ripple texture. 33% from the sale of these earrings will be donated to It's Good 2 Give - The Ripple Retreat and the amazing work they do. The Ripple Retreat inspired this beautiful pendant with a ripple texture. 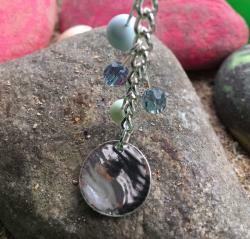 33% from the sale of this necklace will be donated to It's Good 2 Give - The Ripple Retreat and the amazing work they do. the colours are stunning. 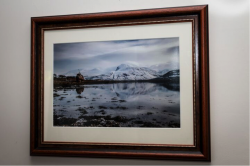 it is on display in our reception area for you to have a closer look. 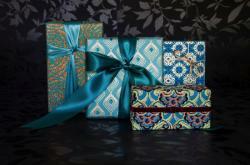 I know lots of people who would love to be able to wrap beautifully. I only know two people who can do it and one of those is Alison Campbell and she has, very generously, offered to host a 3hr gift wrapping workshop including all materials for 4 people. She will share her tips and secrets with you and hopefully by end of the workshop you will be able to create your own stunning gift wraps. Date and time to be mutually agreed between winner and Alison.